The Nativity Scene of wax figures displayed each year, created by Paul Young, Sr., President of Paul R. Young Funeral Homes, captures a defining moment in the history of mankind. The groundwork for this scene began in Colerain School back in a Latin class in 1935. Here Paul Young carved his first figure in a bar of soap. Later he studied Restorative Art in the College of Embalming, where he graduated in 1942. 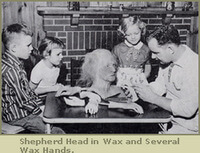 In 1946, Mr. Young attended Madame Tussauds Wax Museum in London to study how to make wax figures. This was a rare privilege and he received knowledge that he was able to use to great advantage. After returning from World War II, he attended the Cincinnati Art Academy for four years where he majored in Sculpturing. He later taught Restorative Art at the Cincinnati College of Mortuary Science for 10 years. There are many people who have contributed to this nativity display. Local residents assist in erecting the barn each year. The original costumes were designed by Mrs. Everett Sortman of Dunlap, Ohio. Mrs. Marian Young made the revisions as time demanded it. All of the figures in the display were originally sculpted in clay of people in our town. A piece mold is made from the original clay figure. The hot wax is then poured into the plaster of paris mold. The wax is inch thick when finished. A little color is added to the finished figure t o give the necessary highlights. The first year, the display was only of the Virgin Mary and the Christ child. It was after studying many Madonnas that he created the Virgin Mary in 1948, and thus started his own great gift to the community. 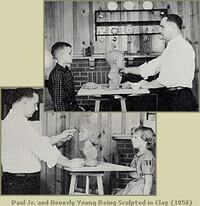 The Christ child was sculpted in clay on a breadboard; the model was the very timely birth of Lynn Young, a niece of Paul R. Young. After several months of sculpting directly from the infant, he then strengthened the infant to project the radiance of the Christ Child. Infant hair was obtained from a local barbershop where a child had just received his first hair cut. 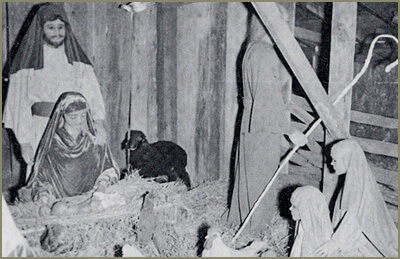 The years following 1948 saw the addition of Joseph, three kings, shepherd, two children, angel and stuffed animals. It's so seldom that one gets to see oneself in wax, but the Young children, Beverly and Paul, Jr., were their father's models when he added the two children to the display. The rooster and hen were hatched from eggs and raised by the Young children. The most tedious job is inserting the hair on the heads, eyebrows and beards of the figures; so few hairs can be placed at a time. Artificial eyes are used to give the likeness of human eyes. The wax used for the figures is of a special formula and some tinting is used to give a more natural effect to the skin. To the people and especially the children, Mr. Young's display is one way to help parents teach their children the original Christmas story of "Peace on Earth-Good Will toward men."